Welcome to our collection of book frontispieces. 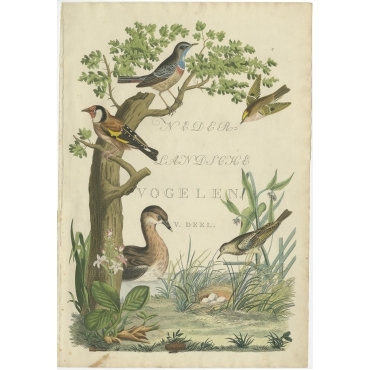 A frontispiece in books is a decorative or informative illustration facing a book's title page. While some books depict thematic elements, other books feature the author's portrait as the frontispiece. 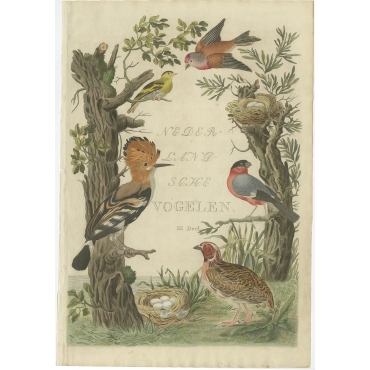 Welkom bij onze collectie van antieke frontispice prenten. Een frontispice (of frontispies) is een decoratieve of informatieve illustratie tegenover een titelpagina van een boek. Bij sommige boeken zijn dit thematische elementen, bij andere boeken kan dit ook een portret van de auteur zijn. 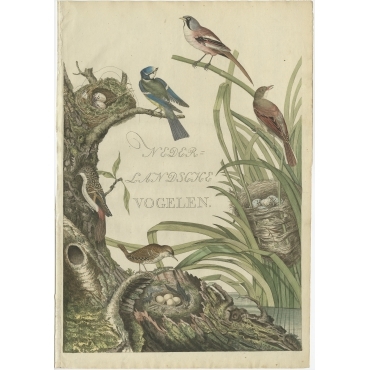 Antique Prints | Frontispiece There are 58 products. 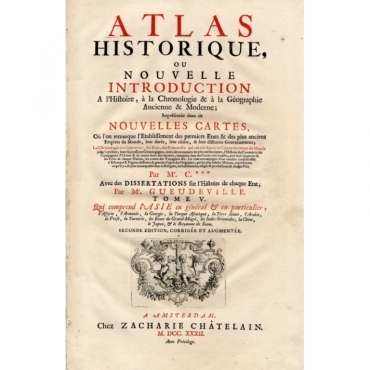 Title Page of the fifth volume of 'Atlas Historique...', with an emblematic engraving by B. Picart. 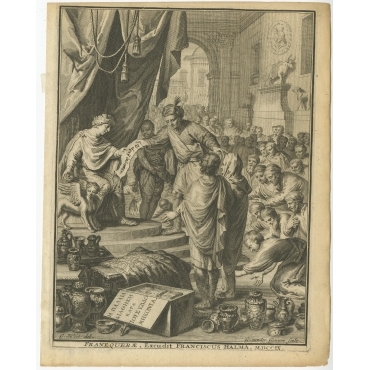 Antique print, titled: 'Gesantschappen aen de Kaisaren van Iapan.' - ('Embassy to the Emperors of Japan'). Title page to the described work. It shows the Dutch and the Japanese meeting in the Japanese court. Gifts are being exchanged. Antique print, untitled. 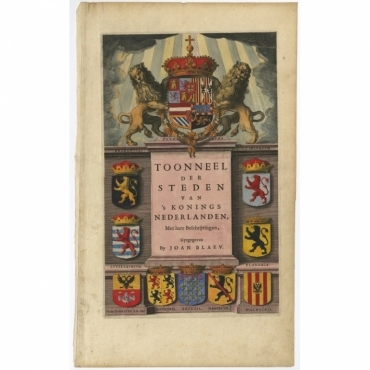 Frontispiece from: 'Amsterdam, In Zyne Opkomst, Aanwas, Geschiedenissen, Voorregten, Koophandel, Gebouwen, Kerkenstaat, Schoolen, Schutterye, Gilden En Regeeringe.' by Jan Wagenaar. 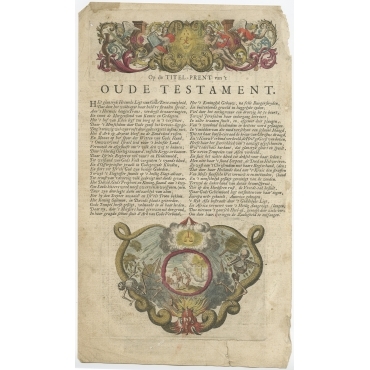 Antique print, titled: 'Toonneel der Steden (…)' - Frontispiece from Blaeu's famous Atlas 'Toonneel der Steden'. 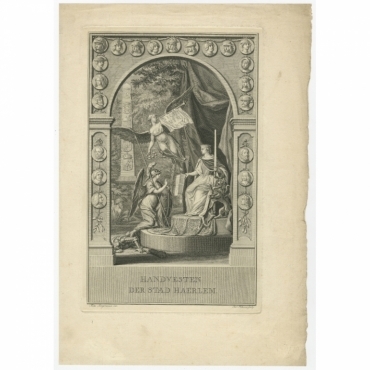 Antique print, titled: 'Biblia Das ist Die gantze Heilige Schrifft verdeutscht Durch D. Martin Luther' - The facade of a classical temple with Christ and Moses flanking the title; on the pediment hangs a coat of arms; title-page to 'Biblia Das ist Die gantze Heilige Schrifft verdeutscht Durch D. Martin Luther'. 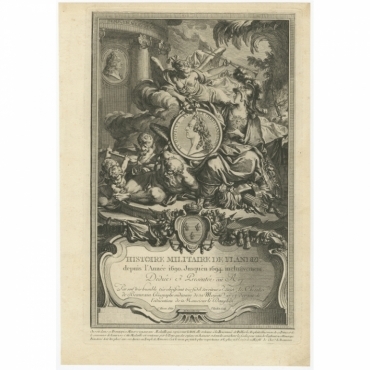 Antique print, titled: 'Histoire Militaire de Flandre depuis l'Annee 1690. jusqu'en 1694 (…)' - Frontispiece from 'Histoire Militaire de Flandre depuis l'Annee 1690. jusqu'en 1694 ..' by Chevalier de Beaurain. 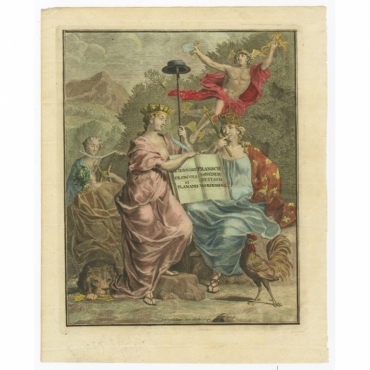 Antique print, titled: 'Dictionnaire Francois et Flamand (…)' - Allegorical Frontispiece of the 'Dictionnaire Francois et Flamand'. Antique print, untitled. 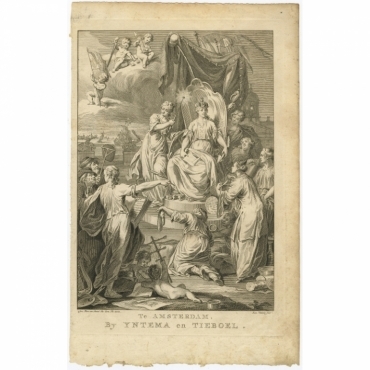 Frontispiece of the NewTestament part of 'T Groot Waerelds Tafereel', by Jacobus Basnage, with prints by R. de Hooghe and with poems by Mr. Abraham Alewyn, published by J. Lindenbergh. 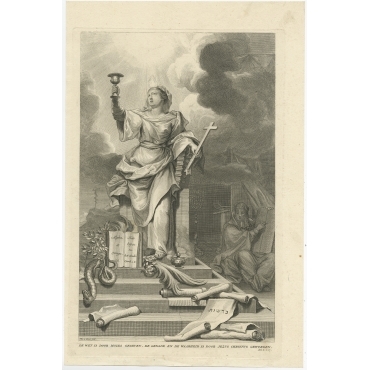 Antique print, titled: 'Dr. 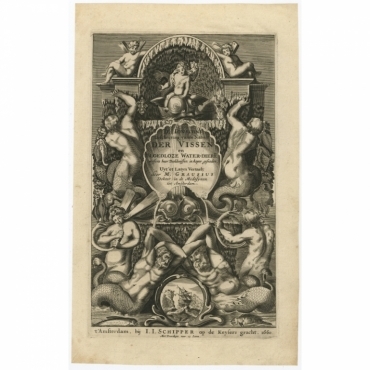 J. Jonstons Beschrijving van de Natuur der Vissen (…)' - Frontispiece of the Dutch edition of 'Historiae Naturalis de Piscibus et Cetis' translated from Latin to Dutch by M. Grausius, published by Schipper, Amsterdam, 1660 ( with plates by Merian). 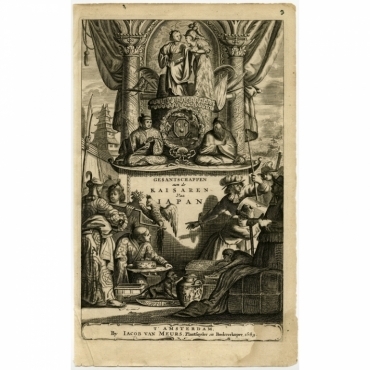 Antique print, titled: 'De Historien van het oude en niewe testament (…)' - Frontispiece of 'T Groot Waerelds Tafereel', by Jacobus Basnage, with prints by R. de Hooghe and with poems by Mr. Abraham Alewyn. 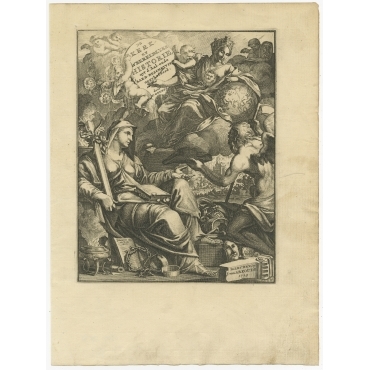 Antique print, titled: 'Syrie en Palestyn' - Frontispiece from 'Syrie en Palestyn' (Syria and Palestine) by Olfert Dapper, published by Jacob van Meurs in 1677. 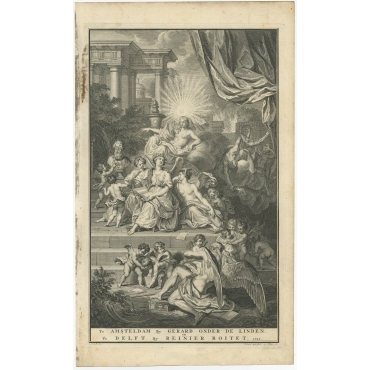 Antique print, titled: 'Histoire Sainte. - Ancien Testament. 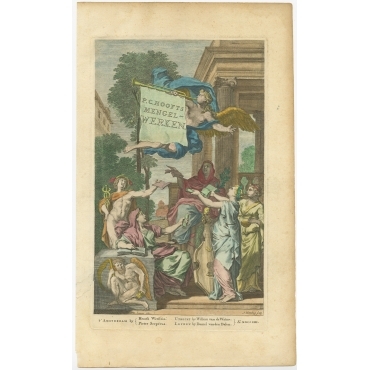 Salomon, construction du temple' - This plate shows a scene from the Old Testament; Solomon, contsruction of the Temple. 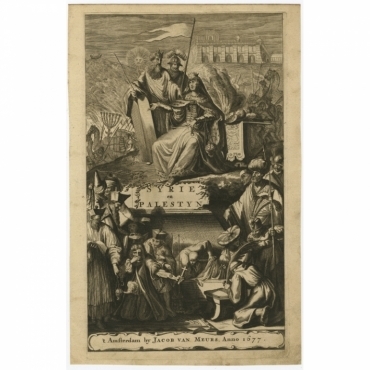 Antique print, titled: 'Libero Sacra Deo (…)' - Original antique frontispiece showing the coat of arms of the province of Friesland, The Netherlands. Antique print, untitled. 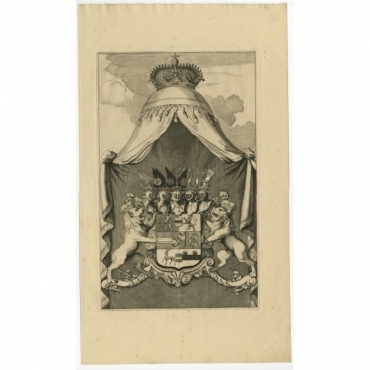 Original antique frontispiece showing the coat of arms of William Karel Hendrik Friso, Prince of Orange-Nassau, The Netherlands.